The meeting of the representatives of the eleven Central Trade Unions held at the BMS Head Quarters on 11th July, 2012 adopted a resolution to call upon the Indian Working Class to intensify the united battle to higher form to force the Government to change its economic policies, which had been the prime cause for the higher level of inflation in the economy and pauperisation of workers. The Central Trade Unions which sent in their representatives to participate in the July meeting were the CITU, AITUC, INTUC, BMS, HMS, AIUTUC, TUCC, ATCCTU, UTUC, LPF and SEWA. 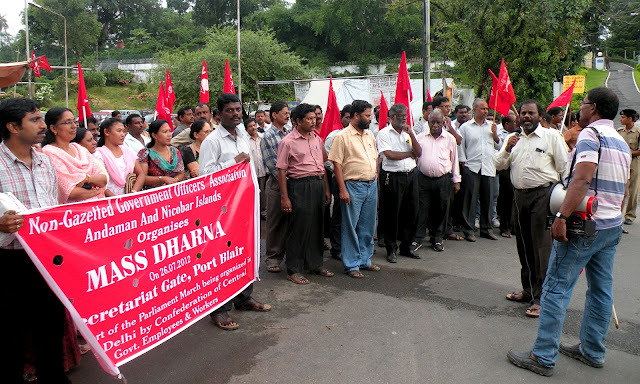 In order to decide upon a massive Trade Union action, the meeting has decided to convene a National Workers Convention at Talkatora Stadium, New Delhi on 4th September, 2012. Confederation has been asked to deploy delegates to participate in the said convention. It is decided that the Central Govt. 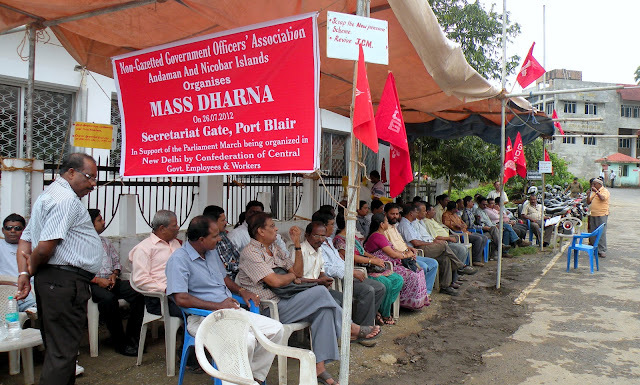 employees who had been participating in the strike action since 1992must participate in the convention in large numbers. Accordingly, the affiliates and the State Committees are requested to depute the office bearers to attend the convention on 4th September, at New Delh, besides the members of the National Sectt. of the Confederation CHQ.. On 5th September, 2012, the National Sectt. will meet at the CHQ to consider as to how best the programmes of actions chalked out by the Convention could be carried out. The meeting will also discuss the ongoing campaign programme to make the ensuing 12th December, 2012 strike a grand success, which is being organised by the Confederation in pursuance of the 15 Point charter of demands. The CHQ received two suggestions, one from the President and the other from the Working President after the campaign programme was placed on the website. Both the suggestions had been placed on the website. We hope that all must have gone through these proposals. In acceptance of the suggestions we request that the State Committees will make it certain that the State Conventions as and when it is organised will have the presence of the office bearers of the State Units of the affiliate besides the State Committee members of the Confederation and all the District and Divisional / Branch Secretaries of all affiliated unions. No doubt the active comrades of the station in which the convention is held must form part of the participants in the convention. All the affiliates of the Confederation are requested to convene a meeting of their decision making fora viz. The National Executive or the National Sectt. as the case may be in the month of October or November, 2012 to review the preparation for the strike action on 12th December, 2012. The Confederation CHQ may be informed of the date of such meeting so as to enable us to depute one of the Sectt. members to participate and interact with the comrades who would be attending such meetings. The meeting so convened by the affiliates, as Com. President has indicated will give an opportunity to review the efforts so far made to make the strike successful and take corrective steps wherever deficiencies had crept in. The Sectt. is preparing a pamphlet to explain in detail each of the 15 demands, the realisation for which the strike is organised. On circulating the draft proposals for holding the State Conventions and other Programmes in preparation of nationwide strike on 12th December, 2012, the headquarters has received two suggestions from the President and the Working President. The suggestions are placed hereunder. More suggestions to make the programmes more successful are invited from National Executive Members and affiliated Organisations and State Committees. We intend placing all such suggestions in the website for the consumption of all concerned and to take a final view shortly - Secretary General Confederation. I have gone through the draft proposal regarding campaign programme circulated by you. As we do not have functioning State Committees of the Confederation in all the States, the programme of district level mobilization/ convention may not be possible in states having no such state committees. I have therefore suggested during the month of Sept/Oct/Nov 2012 all organization affiliated with the confederation may be suggested to hold convention inviting office bearers of all primary units Association affiliated with them. such convention would educate these units level leaders of our affiliates on the demands as also the need for strike action on 12.12.2012 they can be asked to go back to their units Association & re-educate & mobilize their membership & motivate them for the Strike action. Dear Comrade KKN – Greetings. The proposed State Convention to be addressed by the National Executive Members should be advised to be convened with all Divisional and Branch Secretaries of all Circle level Organisations besides the State / Circle Office Bearers of all the affiliates of the Confederation in one place. This will make these conventions strong in attendance and purposeful in quality. The purpose should be to educate the entire State level and Divisional level leadership so that they should be able to span out to all Districts / Divisions within their Circle by the Office Bearers of the State Committee of Confederation [if confederation state body exists] and Circle Secretaries and Circle Office Bearers of all Unions to make the District level or Divisional level Conventions more educative and purposeful. The earlier practice of mobilising some employees of different organisations in the headquarters along with some office bearers of Confederation and Affiliates was insufficient for the purpose. I do not mean that ordinary employees in the headquarters city should not attend the convention. They can attend. But the attendance of all Circle Office Bearers of all Affiliates as well as the Divisional and Branch Secretaries of all Divisions / Branches of all Affiliates will make the State Convention a totally successful and purposeful one. This will be possible only if the all India affiliates of Confederation direct their State / Circle organisations to mobilize for such a composition of state conventions. As the Confederation organised its March to Parliament on 26th July, 2012 in support of its 15 Point Charter of Demands, the comrades of NGO Association of Andaman conducted their mass dharna in Portblair in solidarity. Comrade Ayyappan, the General Secretary, addressing the Dharna can be seen in the second photograph.